Most people are back from their summerholidays by now. We also had some time to rest, but still there are a number of new products to announce. Next to that, we would like to ask some attention for the MS Geocoin. This coin is not new, but helps with the research on the disease Multiple Sclerose but is also a nice coin. There are still a number of XLE zilver/nickel editions available and next to that a number of standard Black Nickel editions. The development of the Troy Geocoin, the result of the Geocoin contest, is ongoing. Some details are to be decided and changed. Below, you will find the most recent version of the design. For sure, it is going to be a very nice coin! Of this great coin, we have now 2 new editions available: a two-tone copper/gold and a gold version. Both are really beautiful editions of this coin. There already a number of 10 years coins available, but we really liked this version, so decided to add this to our collection. The coin tell the story of Geocaching which after 10 years still counts: 'Celebrating 10 years of Geocaching, friendships, adventure, exploring, enduring, leaving no trace & giving back to nature'. A part of the sales of this coin will be donated to the MS organisation in the Netherlands. This Geocoin is the result of the Geocoin contest. The design is not yet completly finished. Below is the current design version. Soon, it will be possible to reserve this coin. A part of the camping tag series, we have 3 new tags. They are all trackable at geocaching.com with its own icon. 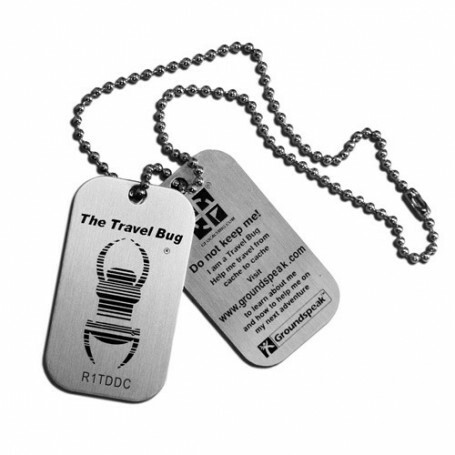 You can find these trackables on our website. All base on the robust containers of Lock&Lock. These sets contain, next to the container and corresponding sticker, logbook and pensil also one or more trackables and a few goodies. The nightcache edition has also a set of 25 Firetags and a set of reflector foils. These sets contain different container versions. Depending on the edition, they have a Lock&Lock container, Petlings, nano's, micro container or Cryo-tube. Next to that also the corresponding pensils and logbooks. Next to our logbooks for PETlings, we have now also green logbooks of 8 x 5 cm. Both logbooks inside are two sided printed and have 25 printed pages with lines. Recently, we added a new pin with an Ammobox, the well known geocache container.